@DavidCarlisle I think we'll need to check them all by hand first! I just noticed that my rep is two palindromes, separated by a comma. Finally, a proper use of the comma! @UlrikeFischer Now we can also apply for a ban on imitations! 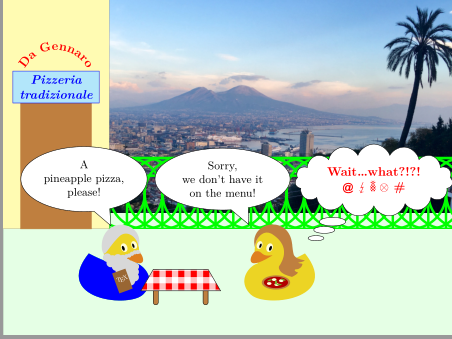 @UlrikeFischer I suggest to call quizza what now is wrongly passed off as pizza. @UlrikeFischer Yay! 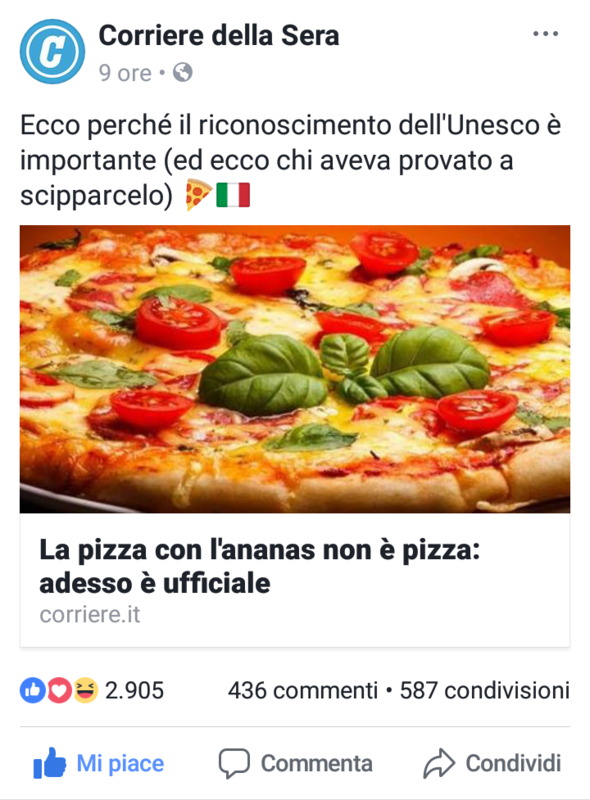 Do they ear about our pizza war? @CarLaTeX as you are here. Did you got the mails? @PauloCereda do you have any good snippets for programming? @AGoldMan I think I have some snippets from snipmate. @AGoldMan cool, which framework are you using? @AGoldMan oh I am not sure it's worth watching, nothing new, specially if you already use ultisnips. I was sick at the time (recovering from pneumonia), so I only covered the very basics and nothing more. Hold on, the UK-TUG account has a link. @CarLaTeX Good. @samcarter are you there?? @UlrikeFischer I am now. How may I help? @samcarter We want to ask you when you have some time. We have a surprise. It makes noises, so you shouldn't be in a conference. And a not too small screen would be good too. We ducks are good at surprises! @UlrikeFischer Oh, a surprise! Right now I am in the office, but I can go somewhere else where noise is no problem. I will ping you again in a bit. @PauloCereda, @CarLaTeX, my husband and me have a christmas present for you. It is a bit early but some ducks are killed by the suspense and not so good at keeping secrets. I will copy the link below the teaser. The entry is protected by a password: the name of a package known to you. @CarLaTeX ooh xspace is a good one. The x stands for X-treme! @UlrikeFischer Oh, this is so gorgeous!!!!!!!!!!!!!! I love it! @UlrikeFischer Many thanks not only to you, but also to your husband! I love the David duck! @CarLaTeX @PauloCereda Also my biggest thanks to you! @samcarter Should I sent a screenshot? There are so many nice new elements, like the pirate duck or the devil duck -- who of you do I have to contact to get these things for the package? @samcarter There is a repository. Paulo will make it public soon. 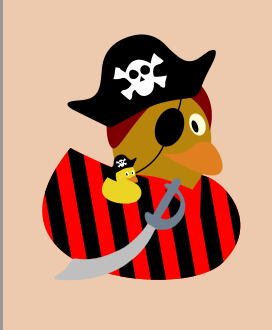 Did you saw the small duck on the shoulder of pirate duck? Done, it's now visible to everybody! @all I probably don't say this often enough, but to all the people from TeX.SE chat: you are amazing! Quack! 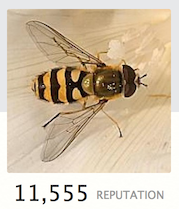 @PauloCereda Thanks a lot for the link - looks very interesting! I know what I will be reaing tonight. @samcarter I might update soon because the video generation is not complete. I had to include a better support, otherwise the resolution gets very low. @yo' -- that is a strong understatement. 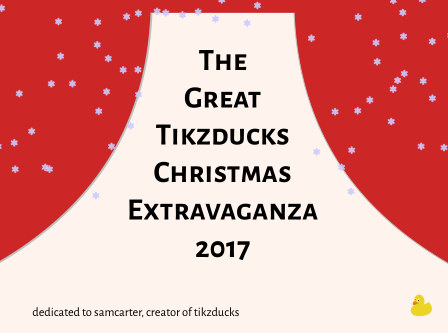 @UlrikeFischer @PauloCereda @CarLaTeX Someone of you should write an answer for the duck pond question pointing to this video! What better advertisement there could be? @samcarter I vote for Ulrike. @barbarabeeton The thing is, they have numbers of ~1600 digits in the article, so there is need for some "special treatment", but this is not it. @barbarabeeton Did you saw the TUG advertisement? @PauloCereda I vote for Ulrike, too. The idea is hers! @DavidCarlisle will enjoy greatly the video. @CarLaTeX The idea is my husbands ;-). I will write an answer but not now. @barbarabeeton See the starred video link from Paulo at the right. @UlrikeFischer -- ah, i had linked that, but not watched it. (waiting for lunch time, but i gave in.) you guys have done a super job! that kind of conspiracy i can appreciate. hip, hip, hooray! @samcarter @PauloCereda @CarLaTeX I added a short answer. @PauloCereda Too bad, I am in the mountains with bandwidth too limited and expensive to be watching any videos. And it's sleeting outside. But now I have something to look forward to when I return to civilisation! @CarLaTeX But without the music it is much less fun (it is interesting how music changes the perception of movements). @HaraldHanche-Olsen It is not sooo large. The file has 17.5MB. @CarLaTeX The the static versions aren't so small either, both overview files have around 7MB (mostly the background of the french ducks ;-)). @UlrikeFischer Oh. Smaller than the git repo, then! I am in the middle of cloning it – it seems to be about 60 MB in total! I may have to buy more bandwidth, but it isn't that expensive, so long as I buy a big chunk at once. @UlrikeFischer Er, no, only 37.8 MB. I misread the git clone status messages. @HaraldHanche-Olsen But the git clone will not contain the video. Only the files to create the base pdf. @UlrikeFischer Indeed. But now I got the video file too. I even managed to guess the password, clever me! @HaraldHanche-Olsen There is now even an open version. See the starred link from Paulo on the right. The password was only for the surprise for samcarter. @UlrikeFischer, @CarLaTeX: I think a repo cleanup is needed, as to only keep the TeX sources and some images. Support images, like background and other assets. @PauloCereda I will look at my folder at the weekend or later this evening. @UlrikeFischer Yes, but I don't want to try streaming video with my current connection. But no problem, I got the download. Only reason I haven't seen it yet is my mother phoned. @UlrikeFischer Watched it now. Wow! “David orders pizza” is even better with music. I have a text file of protein sequences open in Chrome. Which offered to translate the page from Swedish. @PauloCereda Proteins are very popular in Sweden. @CarLaTeX -- and that is not a picture of a pineapple pizza. in fact, it's a very pretty traditional one i think -- cheese, fresh tomato and basil. makes me hungry just looking at it. @PauloCereda -- maybe more common for gulls than for ducks. if you insist on pineapple, then you should at least combine it with spam to be truly hawaiian. @barbarabeeton spam spam spam spam … spam! Lovely spam! Lovely spam! @CarLaTeX See! You're halfway there already. 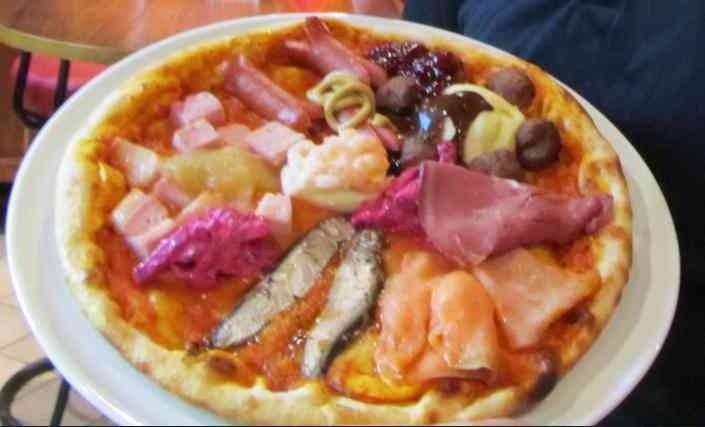 In all this discussion about pineapple, we've forgotten that there are much worse things that could go on a pizza. Like broccoli. @AlanMunn -- actually, i've had broccoli (very small florets) on a "kitchen sink" pizza (which i'm sure would not be approved of by the assembled italian multitudes, even though it was made by the son of sicilian immigrants), and it was quite tasty in that context. @AlanMunn Indeed, or typical "christmas food"
@mickep What are the purple things? @CarLaTeX The one to the left is some beetroot sallad. The one between the sausage and meat balls, I don't know. @CarLaTeX -- broccoli can be quite tasty cooked in chinese fashion with a bit of either garlic or ginger (but not both at once). @CarLaTeX -- the "kitchen sinl" pizza had even more on it; the most obvious was strips of red bell pepper, also olives and mushrooms (both sliced) and slivers of red onion. quite colorful when it was all put together. @JosephWright The more I work with TikZ, the more need I feel for a "pgf+fp"
@JosephWright I know. Please consider this a word of thanks for any effort in that direction! @CarLaTeX -- that's probably a u.s. adaptation. but, as i said, tony (the fellow who made the pizza i described) was the son of immigrants from sicily, and worked in his parents' pizza shop until he got married and moved away. he made really good pizza, and we were sorry when he went away.